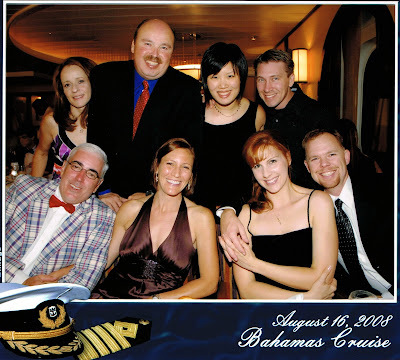 I am back from the 3 day Bahamas cruise I took with fellow fitness bloggers and Pink Dumbbells members Kyra, Irene, and Cathy as well as a crew of 10 from the John Stone Fitness forums, including the illustrious Mr. John Stone himself. While I have yet to organize and tag the photos from my camera, I can tell you that everyone looked fabulous, and much laughing, talking, eating, and merrymaking was enjoyed by all. The festivities really began last Thursday when several of us from the PDB boards met up at Royal Thai for a pre-cruise dinner. Kyra and her husband weren’t able to make it, but Meghan/Megnut3636 was able to make it to the chow down. 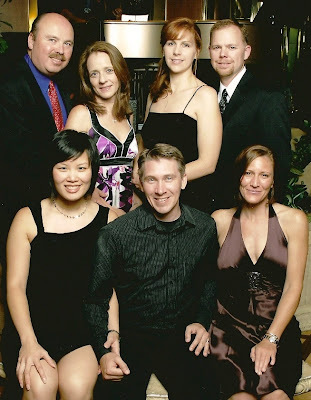 The next morning, Chris, Cathy (who bunked down in our spare bedroom and had to make frequent check-in calls to her assistant at home to reassure her that we weren’t crazy ax murderers), and I motored out to the airport hotels to pick up Kyra, Chris, Irene, and Michael. We wound up making a last minute stop at Target for such sundries as a hoodie for Cathy, snacks, and a workout outfit for my husband, then visited the local Chipotle for a quick bite to eat before heading out to Port Canaveral. 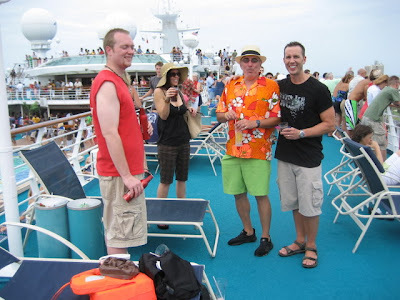 Once we got on the ship, we wandered up to deck 11 where there was a bon voyage party in full swing by the pool. There, we met up with the JSF fellows and gals for drinks on the upper pool deck. This was made much easier by Phillydude’s day-glo orange and green cruise ensemble, which was visible from 2 miles away. The Official Husbands of Pink Dumbbells booty line up! 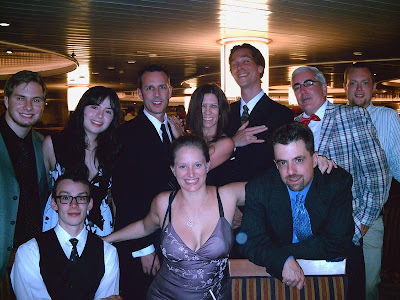 After the party, it was off to our staterooms to finish unpacking, and then up to deck 6 where John, Lisa, Kyra, Chris, Roger, and Tanisha were eagerly sampling the free rum next to the shops. I stayed away from the rum, but did snag a cheap $10 sun hat from the Downtown Jewelry store. Kyra and Roger hang out by the free liquor tasting table. Saturday was spent at the port of Nassau, Bahamas. Alas, Chris and I opted to stay on board the ship since we’d been there before. We didn’t take any pictures by the ship’s pool, but we did get slightly browner all over and much redder on our chests…which we somehow forgot to smother with with sunscreen. D’oh! I was feeling kind of sluggish at this point, and I knew I had to get in some exercise minutes for my Ultimate Challenge team during the weekend, so I wandered over to the gym to participate in their Sunset Stretch class. When I walked in, about eight guests were being tortured with dizzying array of step aerobics moves by the South African RC fitness instructor. I had to turn away from the carnage and warm up with a 10 minute interval run on one of the treadmills. The stretch class was a nice diversion after my intervals, and I felt peppy enough to do a quick strength training workout right afterwards. 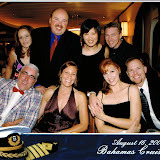 Saturday night was the formal dinner and captain’s reception. Dinner the night before had been casual dress, but this one required cocktail dresses for the ladies and suits for the men. How spiffed up were we? Sunday we docked at Royal Caribbean’s private tropical island, CocoCay, where it felt like a hundred degrees out on the beach. 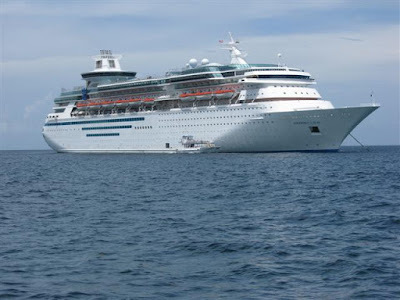 I started the day with a climb up the rock wall at the back of the ship and a Turbulence Training dumbbell/bodyweight fusion workout in the gym, then went back to the room to kick Chris out of bed and go to breakfast. The island was beautiful, but Chris and I didn’t have a chance to explore much of it because we had signed up for a sea kayaking tour and snorkeling. Our tender (fancy term for hopping on a little ferry boat from the cruise ship and motoring to the island instead of docking directly at a port) was a bit later than expected, so we had to jog over to the kayak tour’s departure point, scrawl our names on the accident waivers, and paddle like maniacs to catch up with the rest of the tour group. Whilst we were flailing away, the rest of the group was chilling and resting for about 10 minutes. Of course, as soon as Chris and I arrived, the leader signals everyone to move out. Sigh. At least I got in a work out. We kayaked to a deserted part of the island, dragged the kayaks on to the shore, and got to hang out at the beach (with several large sting rays) for a bit before heading back. Now we were an hour late picking up our snorkeling gear, but the staff at the Snorkel Shack graciously let us redeem our pre-paid snorkeling tickets for masks, vests, and snorkels anyway. We swam out to take a look at the underwater ship, airplane, and miscellaneous rocks and coral reefs near the island and saw many, many fish that could have been extras from Finding Nemo. I would post some photos here, but, well, I didn’t have an underwater camera kit. Sorry! At this point we were pretty hungry and pooped out, so we opted to grab some food at the free BBQ buffet at the center of the island and catch a ride back to the ship to climb the rock wall again and take the stretch class before dinner. Again. So after many meals, tons of sun, lots of chatter, plenty of drinks with umbrellas in them, and a fair share of cheesy shows, I have to say that this was a fabulous group vacation that MUST be repeated next year. Signing out from the Bahamas…hope you can all make it next year! « Star Wars Potluck Pics! I agree. we must make this an annual event! I should have gone snorkeling on that last day. I’ll have to plan better for next time. I really enjoyed meeting you and your husband in person! We missed the reception, but it worked out OK. We would have been toast! I agree with Kyra. This needs to be an annual event!